The Coconut Grove Sailing Club, www.CGSC.org is such a great place to base out of, especially when Olympic Sailors arrive for a few days of practice before the World Cup. Here we are observing world class sailors setting up brand new RS-X windsurfing boards with new 9.5 meter $1,000 sails as we work on grocery shopping, laundry and boat washing. What a contrast! French, German, Spanish, Brazilian, Italian and more languages are all being spoken as rigs are being set up and tested. I spoke to one Brazilian Olympian who has been to 4 Olympics. He told me how these RS-X rigs are all new and that the sails are used for one regatta and then they are retired. You would never arrive at an event of this level with old boat gear. It all is brand new! Amazing to see. Interesting to observe. Walking around Coconut Grove is a real joy as well, with beautiful well planned bike paths and walkways with landscaping and residential high rise buildings with balconies overlooking the harbor. Beautiful grocery stores, Starbucks, Johnny Rockets, Cheesecake Factory, Chili’s, Surf Shops and Ice Cream Shops make for a full choice of shopping and eateries. Add to this a full movie complex and you have a very interesting center of town. We like towns where we can arrive by boat and we like mooring balls where the cost is contained. The Coconut Grove and Dinner Key area has it all, and we consider this location one of our favorites. Here are a few CGSC photos of the scene…. Center of town at Coconut Grove, Coco Walk with Starbucks….perfect! Laundry returning to the boat. Time to pack it away and remake the beds! So here is the current scene at the Coconut Grove Sailing Club and Dinner Key area south of Miami. With the snow and cold storms up north, we are having chilly nights of 50 degrees and days in the mid 60’s, topping out at 70 if we are lucky. Miami is fantastic in Dec, Jan and Feb, what a great place to spend the winter….. Being in the mecca of USA winter sailing location and based at the Coconut Grove Sailing Club, www.CGSC.org, we will be observing and photographing world class International and Olympic Sailors this next week. This is going to be very FUN. ISAF Racing Area right here in Biscayne Bay! Our Track of 47 miles today…. Speedboats, Biscayne Bay, Coral Reefs, Stiltsville, Miami Skyline and a beautiful sunset. Welcome to Biscayne Bay Day #1. Let the fun exploration and review begin. Photos tell the story best. 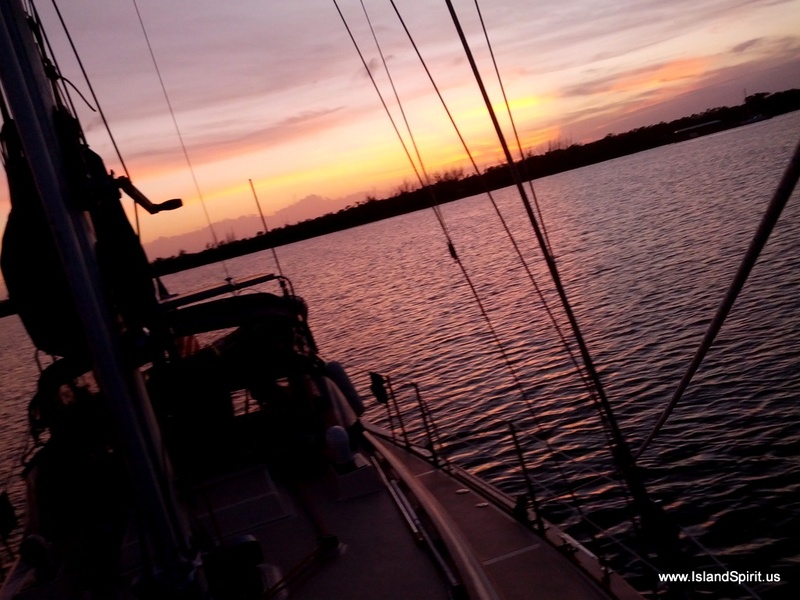 We really like Biscayne Bay, and we are not disappointed by our first night on anchor off Key Biscayne. It has been two weeks since we last docked, so we plan to move into Coconut Grove Sailing Club and or Crandon State Park Marina for some yacht cleaning and land side services. The boat is trashed with salt spray everywhere, and it needs a serious cleaning. What a beautiful trip, now if only the winds would have participated, but they never arrived! Oh well, that is why we have a diesel. Enjoy this trip with photos. Our track from Navionics on our Samsung Tab 2 tablet creates this Google Maps. Tomorrow we make our destination #1, BISCAYNE BAY. We plan to spend many weeks in Biscayne Bay because there is so much to review and re-explore. We Love South Beach, Coconut Grove, Dinner Key, Crandon Park State Marina, Key Biscayne, Boca Chita, Ocean Sailing vs Bay Sailing and so much more. Looking forward to Biscayne Bay sailing…. We sailed from Marco Island, off the west coast of Florida south into the Everglades and had some of the most beautiful skies and clouds we have ever seen. Midway south on the Everglades we ran up into the Little Shark River where we dropped anchor at dusk. What a remote and interesting spot, No services, no cell services, no Internet, but, 65 channels of digital TV. Needless to say, we left that for the alligators, sharks and mosquitoes. We took the advice of a good friend and decided to make this Florida Bay run to Biscayne Bay in daylight hours, due to the five million crab pots and crab float lines all over the bay. At night we would not be able to see these and we might end up catching a crab pot. So, taking that advice, plus the fact that the Gulf was still kicked up with some serious waves, we decide to wait one more day. Now the plan is to make this run in 10 hour chunks, 50-60 mile legs. We will anchor in Shark River in the Everglades on night one, then make Hawk channel on day two and anchor off any key we like with north winds. Then day three we will run Angelfish Creek into Card Sound and up into Biscayne Bay. This is our primary destination for the winter. We have been planning on spending all of January and most of February in Biscayne Bay and South Beach. When the winter fronts die down in the later part of February, then we may run to the Bahamas. Like all cruising plans, they can change tomorrow if we like. Here are the latest PassageWeather.com wind predictions. Remember to subtract 5 hours from UTC to arrive at the correct time for East Coast. You will see the front has passed and the winds are much less. You also will see the next front arriving. Here in Florida and the Bahamas during the winter, we are always living by these frontal systems and really need to time our passages carefully. Thank you again for following our trip. We enjoy sharing his cruising dream…. That is our plan as of Wed night, 24 hours before we go. Here is what the winds are forecast to be. Note, that UTC time is 5 hours ahead of East Coast Time, so minus 5 from the UTC time to figure out the time for the winds. You play weather forecaster and you tell me when you would leave…. If all works as it looks, we should have 15 knots of NW to N winds behind us all night long. Lets hope so because it is the Everglades and no where to pull into to…. The Log rolls over to 100 nm…. Departing Burnt Store Marina and saying good bye to our good Kansas friends, Alan and Kathy, was not easy, but cruisers eventually move on. We left the docks with the winds blowing 20+ knots out of the north and set a staysail on Charlotte Harbor running south. As we headed south towards Cabbage Key once again, our log turned over to 100 nautical miles since leaving Palmetto, FL. Imagine going 100 miles at 5 miles per hour! It really feels as if we have not gone anywhere as of yet, but then again, this is exactly what the plan is for this year. The plan is to have no plan and to sail where and when we want to, and to anchor and stop wherever. Yes, we are heading to the Bahamas, and, yes, we are heading to the Abacos, especially THE JIB ROOM, and,yes, we are first heading to Marathon and Biscayne Bay. Our calendar on the menu link above has our best guess plans outlined for the next year. We are now in Fort Myers Beach Florida on a city mooring ball in the harbor. Moorings are $15.00/ night and we can take the dinghy into the docks and walk to the beach. This is one of our favorite places on the West Coast of Florida with a beautiful beach, a great harbor, and plenty of restaurants, pubs, and shops to explore. 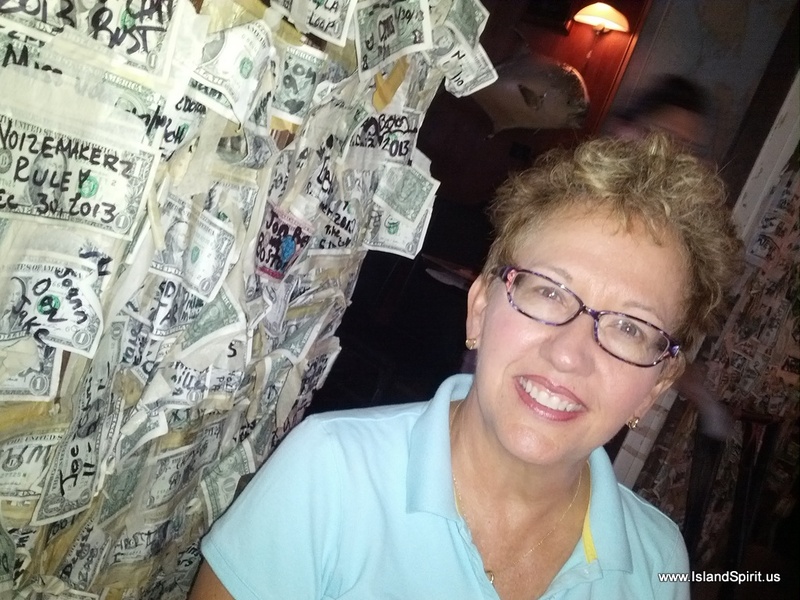 Last night was “date night” at Bonita Bill’s where we connected with more boat buddies, Judy and William of IP37 Optimystique from Tennessee! We enjoyed the freshest shrimp imaginable right off the shrimp boat and listened to a terrific band, (www.DebandRayeh.com). The drummer, Deb, was the lead singer and her partner, Ray, played the keyboard and also sang. Add in a few underlying tracks and they had the crowd dancing to their great cover songs. What a fun night! Tom and Linda of MV Q’s end. These Canadians are Great Loopers. Where to next? Most likely down to Marco Island but not until we fully review this beach front town. It is 75 degrees today and the sun might burn off the clouds. Thanks for traveling along. Island Spirit with Flatlander at Burnt Store…. We diverted up Charlotte Harbor to Burnt Store Marina so we could visit our wonderful friends, Kathy and Alan, AKA “Kansas Kids” with the IP420 named FLATLANDER. We sailed the Abacos together in 2011 and connected last year in Marathon, too. Alan and Kathy are great friends and we so enjoy visiting them and learning about the BSM area. Imagine living where you can drive a golf cart from your home to your boat or tennis courts or restaurants or pubs. Now this is a really cool place and I can see why so many people speak so highly about Burnt Store Marina. The only negative I see is that it is 10 miles up one road to Punta Gorda for all services, shopping and support. Otherwise, this is a great boating, golfing and marina setting. Here are some photos of the past few days…. Who wants to dry off the teak? The fun of cruising is cruising and meeting friends and seeing new places and visiting old places. You go where you want to go, when you want to go and when the weather lets you go. Such is the simple life of a cruiser. 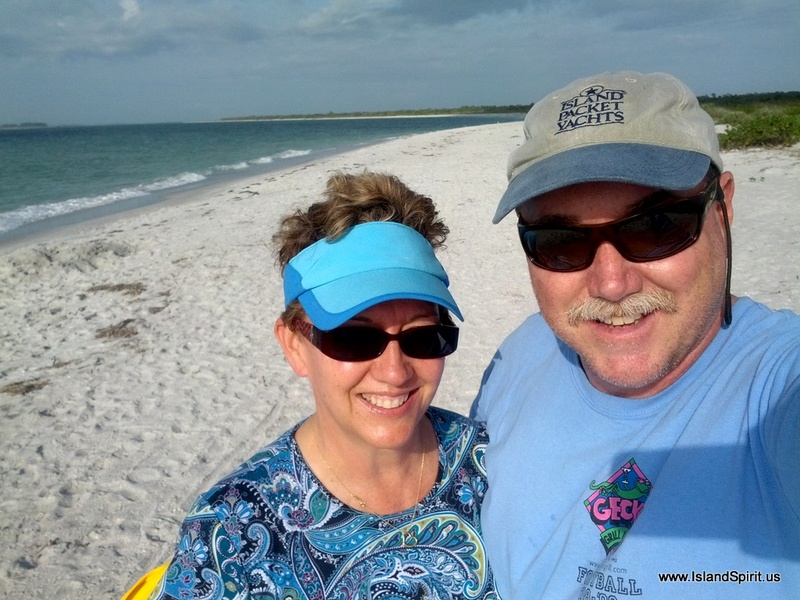 Radeen and Hayden on the Beach…..
We love it here at Cayo Costa where there is plenty of anchorage area, a Florida State Park, zero development, no services but water, just a beautiful beach with friendly volunteers. Who could ask for more? Not us. Life is great on a cruising sailboat. 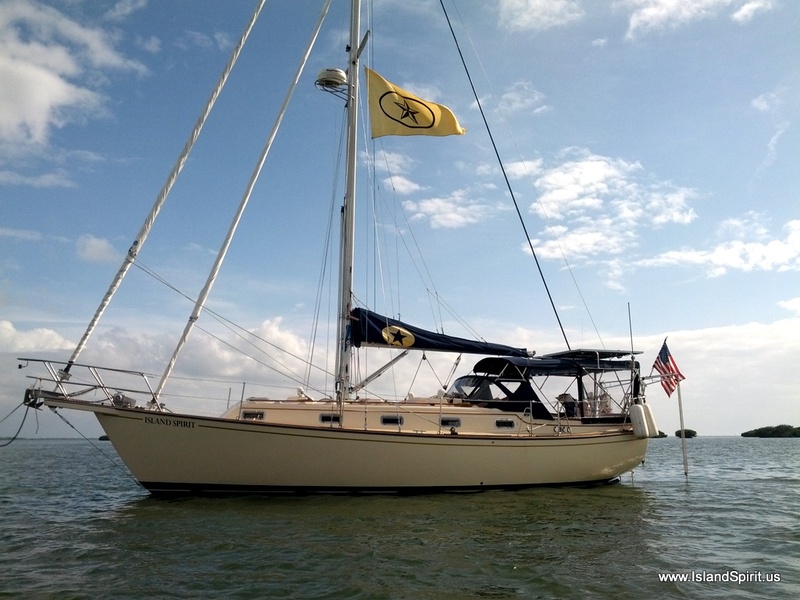 It is wonderful to be back living on anchor and living on our sailboat. Life slows down. Life gets so easy (when all systems are working) and life is very peaceful. Yes, we have digital TV, but it has not been on for many days. Yes, we have satellite radio and, of course, listen to the Jimmy Buffett channel. Yes, we have connectivity via Verizon cells and our app PDAnet+ for our WiFi hotspot and, yes, we share via Facebook and this blog. Even with all this connectivity, somehow life on a sailboat is just simple and basic. Days run together, and you are lucky if you even know what month it is, let alone what day of the week it is. You just live, relax, read, laugh, enjoy, explore and discover. 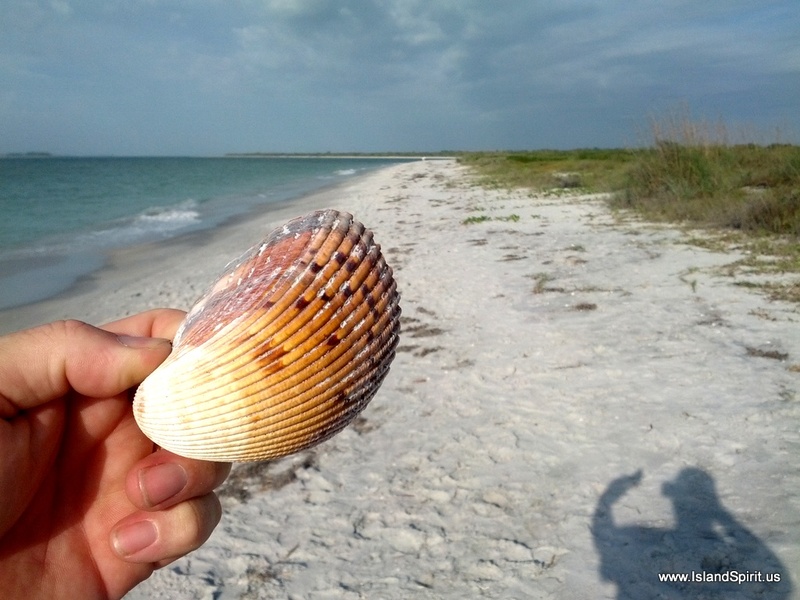 Cayo Costa in Pine Island Sound is one of those places NOT to MISS on the west coast of Florida. 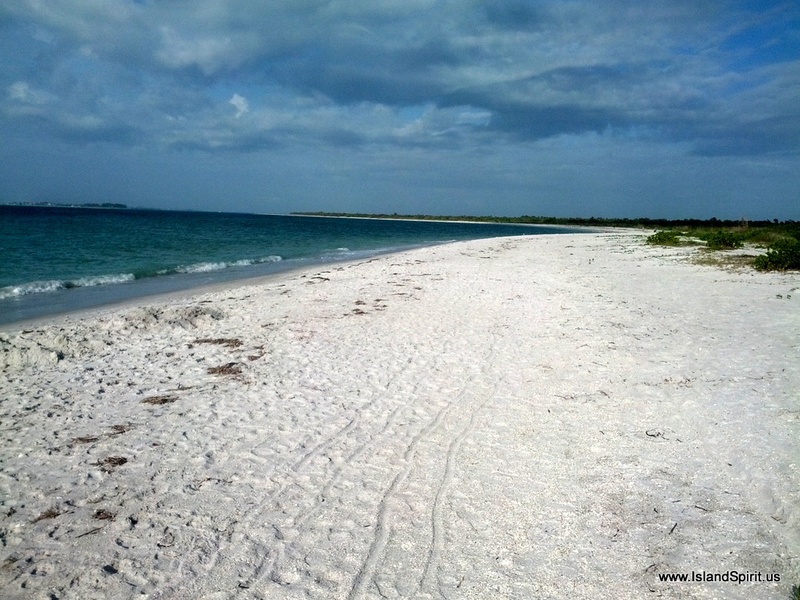 It is located just south of Sarasota and north of Fort Myers Beach. It is a great location with a deep ocean inlet to the north, providing an easy exit if you want to go to sea. For now, we may just stay here for days, after all…..why not? My favorite way to share this adventure is though my photos. Please enjoy these. Look at the crowds! This is crazy! The best shell found today, there are so many.